The current experiments on structural determination for RNA molecules cannot keep up the pace with the steadily emerging RNA sequences and new functions. This underscores the request for an accurate model for RNA three-dimensional (3D) structural prediction. Although considerable progress has been made in mechanistic studies, accurate prediction for RNA tertiary folding from sequence remains an unsolved problem. The first and most important requirement for predicting of RNA structure from physical principles is an accurate free energy model. Based on rigorous physical principles, Chen’s lab is developing computational models to predict 3D tertiary structures, energy landscapes, and kinetic mechanisms for biologically significant RNA molecules and from the physical model, to analyze and predict RNA functions in gene regulation. 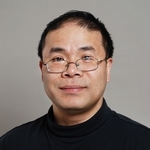 In parallel to the theory development, the Chen lab is developing strategies to apply the computational models developed in the lab to a broad range of problems directly related to human health such as the rational design and selection of RNA-based therapeutic drugs.